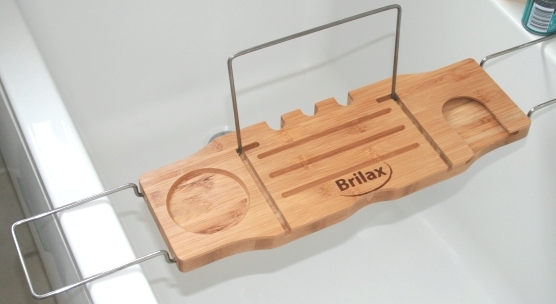 This is cool, a bath caddy from Brilax made from bamboo wood and incorporating adjustable steel arms and a fold-up book rest. (I say book rest as opposed to a tablet because to be honest I wouldn’t put a tablet over my bath water because the bubbles might get to it and over the duration of the soak, the steam would invade the electronics no doubt. Having said that, if you have a waterproof tablet or phone, then this would be ideal). I have been provided with this bath caddy and am reviewing it here on raptor having got a very more than reasonable discount. I had barely even heard of these caddys before and had never considered getting one for myself. However when I tested it out, it turns out that I will probably never bathe in the bath again without it. You see the edges of my bath in particular are quite thin – its one of those which is made this way in order to maximise the width of the space available for water, so that the volume of water held in the bath is higher than a normal walled bath. This means its difficult for me to balance my pint pot, shaving mirror and other bits n bobs on the edge without them slipping off. Infact I have to have a small table by the bath which is a pain. This fabulous bath caddy concept gets rid of this problem in one go. See the picture below of my caddy in action (before I jump in of course). 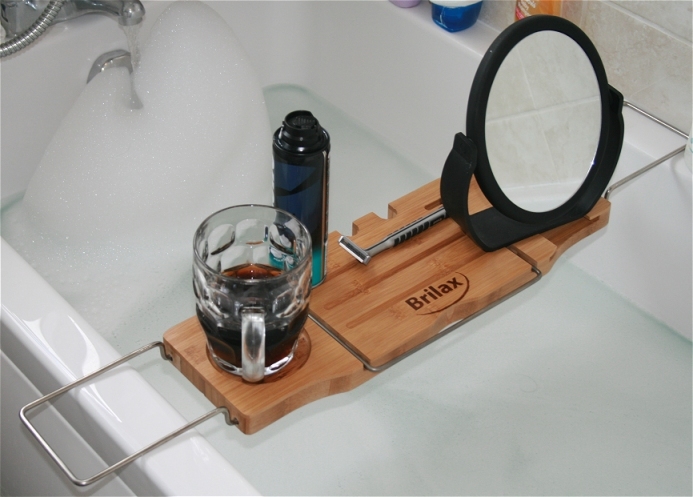 As you can see, I have used it to place my shaver and foam on, along with my small bath mirror and of course a pint pot with iced coke in it. This is extremely handy, no more looking left or right into the mirror whilst having a shave in the bath – and no worry of the mirror sliding off the side into the water either. Features of this Bath Caddy. This bath caddy has, as you can see above, two metal arms which are extendable for those with even wider baths than mine (which is pretty much a standard size apart from the thinner surround). These are pulled out easily and then they simply rest on the bath on either side. 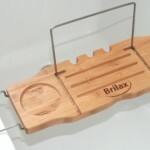 They are firm on the Brilax caddy I am reviewing here, in other words it would be quite difficult to make the setup wobble or slide off. I have no reservations about balancing anything on it – a full pint (although this is showing only half) is easily held and sits in the recessed slot provided to prevent slippage and having it spill into the water. In addition to the supporting arms, there is a fold-down bar which can be raised to support a tablet if you have one which is waterproof. I would not suggest putting a non-waterproof tablet above a hot steaming bath. 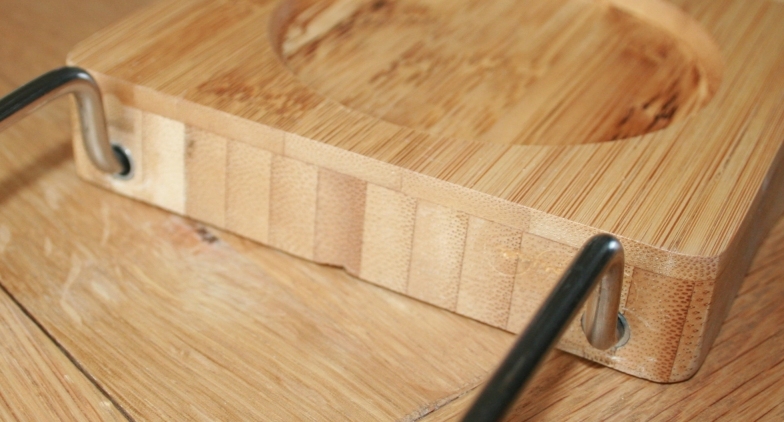 The woodwork is very clean and tidy, with a super smooth water resistant surface (maybe it has been waxed or coated so the water runs off in rivulets) and it has various slots and grooves in it to add both character and functionality. On the right hand side there is an undercut section which would be ideal for pushing a wine glass into, on the left there is a circular slot as you can see. Above you can see an edge on view of the caddy, it is made from laminated strips which run longways and is capped and edged with further real bamboo laminate making for a sturdy and more than likely long lasting product which will resist water ingress and be resistant to warping. The colour is natural which in itself makes it appealing to look at along with its general shape and overall design. I’m really not one for jumping in and out of the bath in a hurry, I like to take my time – so this is an ideal addition to my bathroom utilities. It moved easily along the bath when I needed it out of the way just by sliding it along. It is heavy enough to make it feel top quality and firmly balanced. I would recommend.